This is a surprisingly accessible book for anyone who wants to explore painting with acrylic. You don't need any experience with art or painting to get started. The book covers all the tools required, the basic painting concepts and then get into the 50 painting projects. I'm particularly impressed by the amount of information included. I've little knowledge of acrylic and I learned a lot from the introduction to these paints and the way you should prepare them. The 50 painting projects are designed in a way to build up your confidence. It starts off by painting with simple techniques. Later projects just build on to whatever that's taught earlier. The first few projects are of simple subjects that can be painted within a few hours. Later projects require more details but still manageable even for beginners. 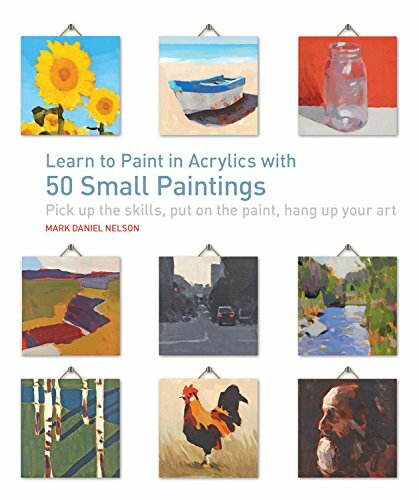 It's an insightful book with many useful techniques that may even be useful to intermediate acrylic painters. The nice thing about this book is, the author Mark Daniel Nelson really wants you to have something physical to show for, to have a painting at the end of each project that you can actually hang on your wall at home. Do you think that the techniques presented by this book would work on gouache painting? Sure, should work since both are opaque media.